BYU signs long-term football deals with ESPN, Notre Dame. 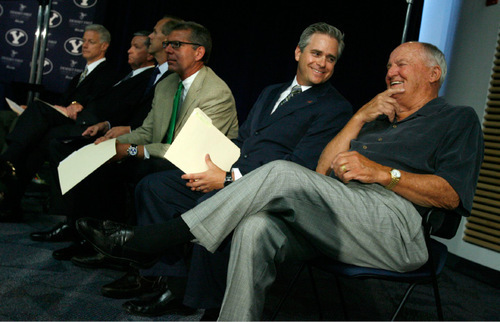 Francisco Kjolseth | The Salt Lake Tribune&#xA;West Coast Conference Commissioner Jamie Zaninovich, second from right, shares a laugh with former BYU football coach LaVell Edwards, far right, as BYU holds a news conference Wednesday to discuss their move to football independence in 2011 and the shift of most of their other sports to the West Coast Conference. In addition the program signed an 8-year pact with ESPN to televise Cougar football on the sports leader's family of networks and will also partner with BYU. 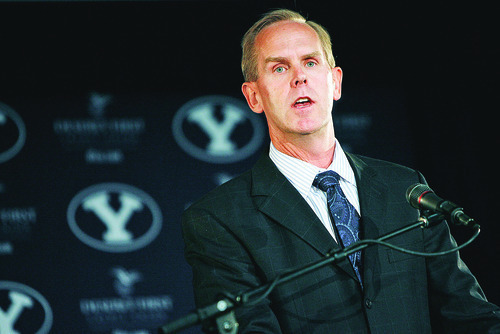 Francisco Kjolseth | The Salt Lake Tribune BYU's Athletic Director Tom Holmoe at a September press conference discussing the football team's move to independence in 2011. 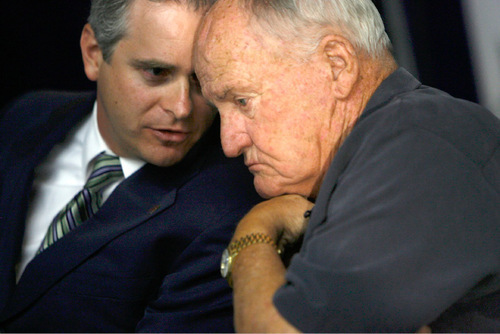 Francisco Kjolseth | The Salt Lake Tribune&#xA;West Coast Conference Commissioner Jamie Zaninovich, left, speaks with former BYU football coach LaVell Edwards as BYU holds a press conference at LaVell Edwards Stadium in Provo on Wed. Sept. 1, 2010, to discuss their move to football independence in 2011 and the shift of most of their other sports to the West Coast Conference. 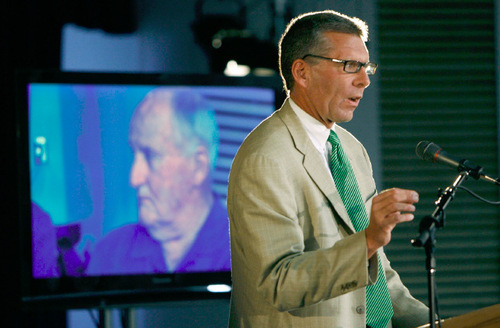 In addition the program signed an 8-year pact with ESPN to televise Cougar football on the sports leader's family of networks and will also partner with BYUtv.&#xA;Provo, Aug. 30, 2010. Francisco Kjolseth | The Salt Lake Tribune&#xA;&#xA;ESPN's Dave Brown points to the legendary influence of former BYU coach LaVell Edwards (on screen behind) during an event announcing the Cougars' jump to football independence. Jim Urquhart | The Salt Lake Tribune&#xA;&#xA;As usually is the case in the Spectrum, the Utah State fans played a key role in the Aggies 71-61 win over Brigham Young n. Utah fans celebrate a field goal by Utah kicker Louie Sakoda (35) during the Utah BYU game Saturday November 22, 2008. 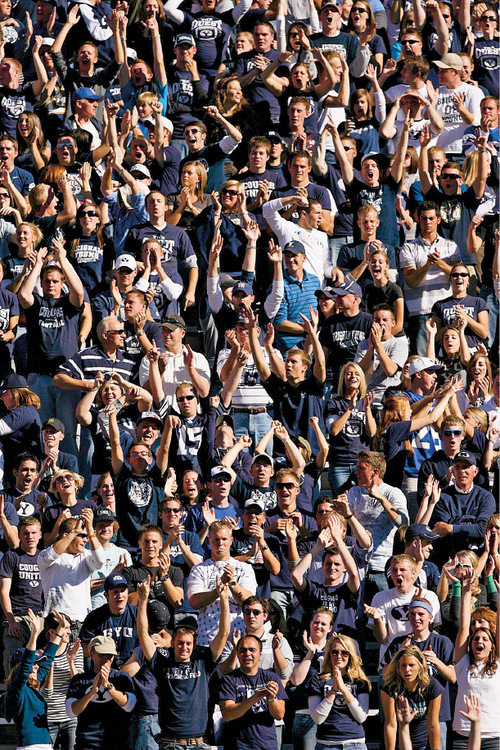 Trent Nelson/The Salt Lake Tribune Fans cheer after BYU made a two-point conversion for the final score against UNLV, Saturday at LaVell Edwards Stadium. 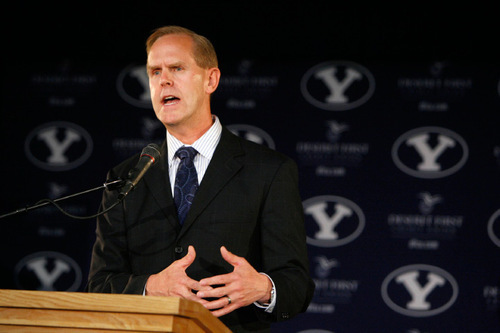 Trent Nelson/The Salt Lake Tribune Francisco Kjolseth | The Salt Lake Tribune BYU Athletic Director Tom Holmoe, speaking at the September press conference in which the school discussed its move to football independence, said the school grew weary of unfulfilled promises. Francisco Kjolseth | The Salt Lake Tribune BYU's Athletic Director Tom Holmoe holds a press conference at LaVell Edwards Stadium in Provo on Wed. Sept. 1, 2010, to discuss their move to football independence in 2011 and the shift of most of their other sports to the West Coast Conference. In addition the program signed an 8-year pact with ESPN to televise Cougar football on the sports leader's family of networks and will also partner with BYUtv. Provo, Aug. 30, 2010. Provo • Brigham Young University athletic director Tom Holmoe described the process of turning the school's high-profile football program into an independent and placing its other sports in the West Coast Conference as fun, exhilarating, hard, terrible and great. But most importantly, a bold, confident and direct Holmoe said, "the process is done." Holmoe and other BYU officials announced an eight-year partnership with television sports giant ESPN, a move to the WCC for most of BYU's other sports teams and an agreement to play Notre Dame in football six times in the next 10 years during a news conference Wednesday at LaVell Edwards Stadium. "We knew we could not let this window of opportunity pass us by," Holmoe said. Added BYU President Cecil Samuelson: "We are convinced we are taking major positive steps forward." The conference-affiliation and deal with ESPN are set to begin in the fall of 2011 as BYU ends its affiliation with the Mountain West Conference (MWC) on June 30, 2011. It is not yet known when the deal with Notre Dame will start, or how many games will be played at each venue. But Holmoe said the series will go through 2020. 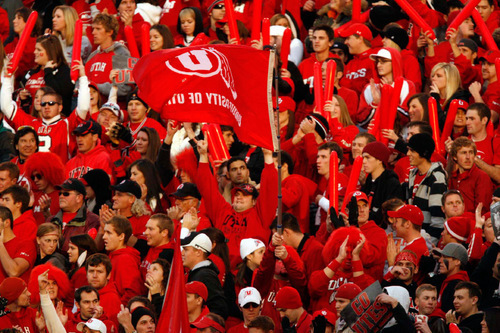 "This is something we have been working on for about five years," Holmoe said but acknowledged that it was sparked by Utah's June announcement that it was jumping to the Pac-10 in 2011, a lucrative move that threatened to leave the Cougars far below their instate rival's earning potential in television revenue. Samuelson and Holmoe said the reason for the bold moves are twofold: access and exposure. "Independence [in football] increases access to our games for fans everywhere and it increases the exposure for our student-athletes," Holmoe said. BYU and the Western Athletic Conference also announced jointly Wednesday an agreement in which the WAC will provide BYU will several football opponents in 2011-12. The deal alleviates concerns that the independent Cougars will have trouble finding 12 football opponents once they leave their guaranteed eight-game conference schedule in the MWC. Pointing to the agreement with Notre Dame and other schools he did not specify, Holmoe said he is confident the Cougars can fill their schedule with quality opponents, both at home and on the road. "One thing that helps us is we are a national school," he said. "There are many schools we've played in the past and will play in the future who realize when we play a game on the road, [BYU] fans will be there" and increase the home team's revenue at the gate. Although BYU's announcement has already been met with anger and hostility from MWC schools, Samuelson said "We have enjoyed our affiliation with the Mountain West Conference and its member schools. We'll remember them fondly, and we wish them well." Dave Brown, ESPN vice president of programming and acquisition, appeared at the news conference and called it a "tremendous day to be back in business with BYU. We've had a great relationship with BYU over the years." Financial terms of the BYU-ESPN deal were not released, but estimates put it anywhere between $800,000 and $1.2 million per home game. Brown said a minimum of three BYU home games per year will be carried by ESPN, ESPN2 or ABC. Additional games could be shown on ESPNU, and at least one game each season will be carried live on BYUtv, the network owned by the school that reaches about 55 million U.S. homes. Put more simply, ESPN will broadcast nearly every BYU home game on one of its platforms. Samuelson said the "driving force" behind BYU's quest for football independence was to secure broad and nationwide television access to BYU athletic contests for the school's fans around the world. West Coast Conference Commissioner Jamie Zaninovich acknowledged that he contacted Holmoe the day after news broke that a plan for BYU to join the WAC was scuttled by the defections of Nevada and Fresno State to the MWC. The two became acquainted in 1992 when Zaninovich worked on radio broadcasts of Stanford football games and Holmoe was an assistant coach on the Cardinal staff. Zaninovich called the merger "a historic day" for the WCC. 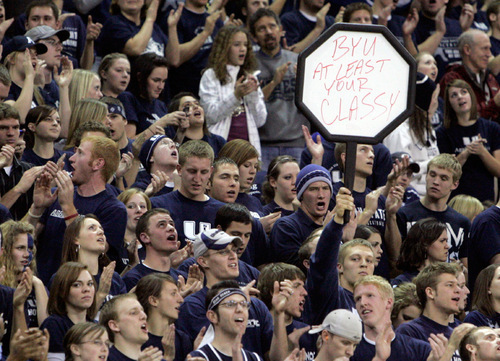 "Simply put, BYU is a great fit for us," he said, alluding to BYU becoming the conference?s ninth faith-based institution, BYU's "immediate competitiveness" in sports the WCC offers and BYU's "national brand" in athletics. Holmoe said 58 percent of BYU's alumni base lives in the WCC's footprint. Brigham Young basketball coach Dave Rose also spoke positively of his high-profile program's move to the WCC. "The challenge is still the same [of getting to the NCAA Tournament]," Rose said. "We're excited about the new locations, and we'll work towards that after we're done with this season." Left unresolved was the future of BYU's softball, swimming/diving and track and field teams. The WCC does not sponsor those sports. Holmoe said school officials have already begun the process of finding homes for those programs and have started negotiations with "other conferences." 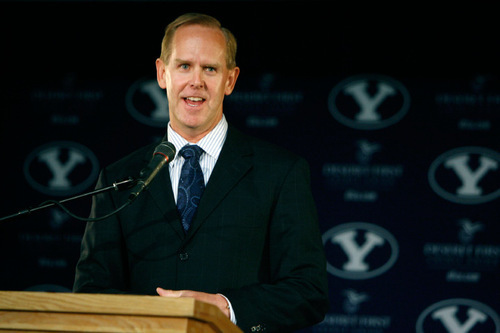 Holmoe acknowledged that football independence makes it easier for BYU to continue its rivalry with Utah. He said discussions with Utah athletic director Chris Hill have been positive and that they are just a few small details away from finalizing an agreement for a long-term series. "I have known Dr. Samuelson for a long time, and I am sure that he and Tom Holmoe are doing what is in the best interest of Brigham Young University and its mission. We wish them the best of luck and look forward to continuing our long-standing relationship with them. I fully anticipate that ours will continue to be one of the nation's great athletic rivalries." Added ESPN's Brown: "We can't wait to get that game on ESPN."